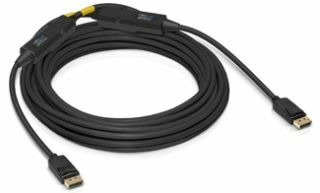 DVIGear has introduced a new line of DisplayPort v1.2 fiber optic cables, the DVI-26xx-FO series, which is capable of extending DisplayPort signals with resolutions up to 4K/60Hz (4:4:4) at lengths up to 130 feet (40 meters). Designed to overcome the limitations of sending digital DisplayPort signals over copper wires, DVIGear's fiber optic cables provide signal fidelity and transparency at resolutions up to 4096x2160 @ 60Hz over the entire length, according to the company. DVIGear’s DisplayPort v1.2 fiber optic cables are designed for use in mission-critical applications where image quality and dependability are paramount. The video signals are transmitted over four optical fibers, which make them immune to interference from environmental noise sources, and the optical transmission path provides a low RFI/EMI profile, which allows the cables to be installed in sensitive applications with strict security requirements. The cables draw power from the connected DisplayPort source, which eliminates the need for an external power supply and makes the cables useful in applications that require long DisplayPort cable runs. These cables are available in a range of standard lengths up to 40 meters and are shipping now.